London, 14 February 2017—Twenty of the world's leading public health institutions defined and committed to a standard training package for rapid responders deployed to deal with major disease outbreaks and public health emergencies. 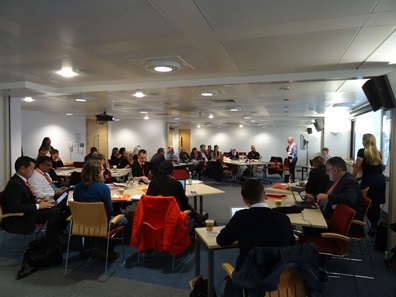 Public Health England (PHE) and the World Health Organization (WHO) co-hosted the first major workshop of the Global Outbreak Alert and Response Network (GOARN) partners to develop a coordinated programme to prepare highly-trained rapid responders for their next deployments. Disease outbreaks can occur anywhere, anytime, with consequences that can shatter communities. Every month, WHO receives more than 5000 disease alerts, and identifies 300 for follow up, and performs more than one field investigation every day. When a disease outbreak develops and international support is needed, WHO calls on GOARN partners to assist countries with the response by deploying experts for investigations, and to provide guidance and build capacities of local health workers on the ground where the outbreak is occurring. In 2016, WHO deployed over 1400 individuals to the field to respond to public health emergencies and support affected countries, of these over 900 were recruited externally, including from GOARN institutions. Participating institutions represent existing public health and outbreak response training programmes, activities and best practices. Partners agreed on training priorities and on collaboration on a multi-tiered and multi-faceted GOARN Training Programme for enhanced global capacity for safer and more effective outbreak response. The new training programme will guide responders on how to work within WHO’s new standardized system for response. Partners will be able to work together seamlessly with WHO and allow responders deployed to an emergency to focus on the response rather than dealing with hiccups that come from navigating different systems and practices for managing disease outbreaks. In addition, responders will have a clearer understanding of navigating different cultures and contexts. “During an international response to an outbreak, responders need to carry out their vital work while understanding how to do so in different cultures and contexts. This workshop is another important step in ensuring the world is better prepared to detect and respond to disease outbreaks and the learning will add to the increasing international knowledge about how to keep domestic and international populations’ safer.” said Brian McCloskey, Public Health England Consultant in Global Health Security, and GOARN Steering committee member. Following the 2014-2016 Ebola crisis, WHO and partners committed to strengthening the global health emergency workforce to be ready and available to work together more seamlessly. WHO continues to work with governments and other partners to improve the capacity to rapidly detect and respond to new disease outbreaks. Governments dealing with a disease outbreak often need experts to help respond with the emerging threat or to help with the response to a public health emergency. They also need to understand what is available from neighbours who might offer help, and from regional and global networks that can provide experts. GOARN plays a primary role in WHO's response to disease outbreaks by mobilizing experts from partner institutions and networks to support governments and WHO when a major outbreak is detected. “ Our partners see tremendous value in pooling in their resources into this collective training programme, to ensure that all their staff that go into the field on the next major disease outbreak as responders, will have the understanding and familiarity of the international response in place to hit the road running. We are confident that additional agencies will see similar value and come on board as this programme is rolled out” Mr Patrick Drury, Manager GOARN. With over 16 years of infectious disease outbreak and disaster response experience including the most recent Ebola epidemic in West Africa, GOARN is at the centre of WHOs response and resilience strategy. Strategically designed to coordinate and streamline technical institutions within and beyond the United Nations infrastructure, GOARN mobilises the response capacities of international NGOs, national public health institutions, laboratory networks, national NGOs and regional public health agencies to rapidly support countries for outbreak response. in response to cholera outbreak currently ongoing. The training programme is the first of many coordinated activities planned by the Network to engage partners. GOARN hopes to attract other existing GOARN partners and new partners to make commitments and take actions that will help to solve some of the world’s most pressing public health challenges.